The weather has definitely changed here in Eastern Kentucky. It has me longing to bake bread, decorate for fall, and sit by a cozy fire. I love puttering around the house and I’ve been busy the last couple of days cleaning and cooking. It feels nice. After a busy summer it’s special to slow down and enjoy being home more. 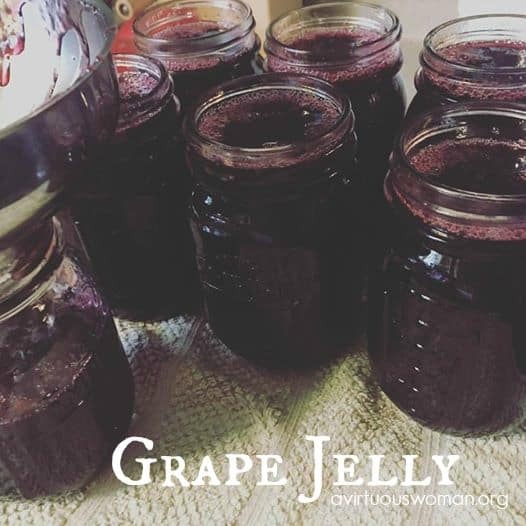 I also enjoyed canning grape jelly today from the grapes we harvested from our grapevines. What have you been up to? Our memory verse for today has two parts. 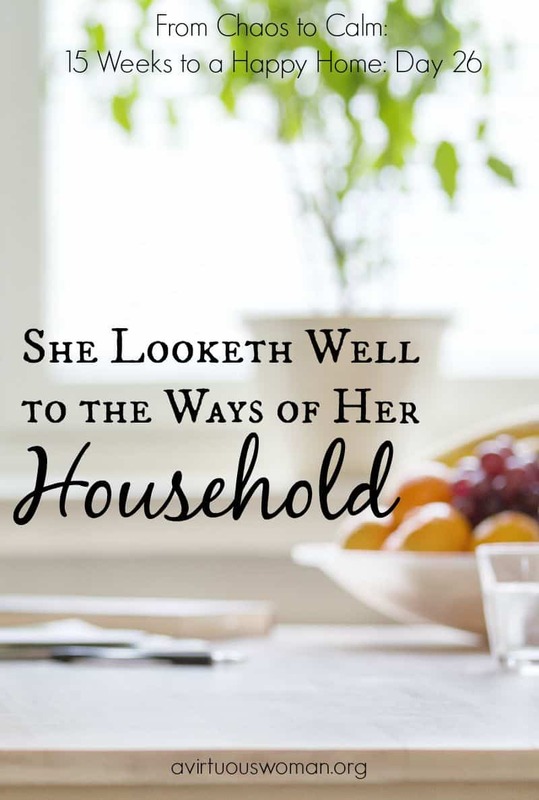 In the first part, we are told that the Proverbs 31 woman looked well to the ways of her household. It does not tell us that this woman, a mother, did everything herself! So, if you were dreading the idea of trying to be Super Woman, have no fear. We are going to learn some simple and efficient ways to run our homes so that our home life is a happy life. 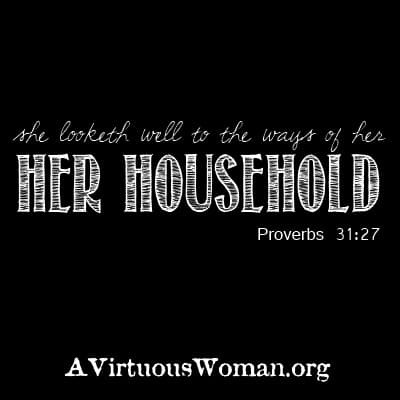 The second part of the verse tells us that the Proverbs 31 woman worked hard. She was not lazy and she did not put off til tomorrow what needed to be done today. 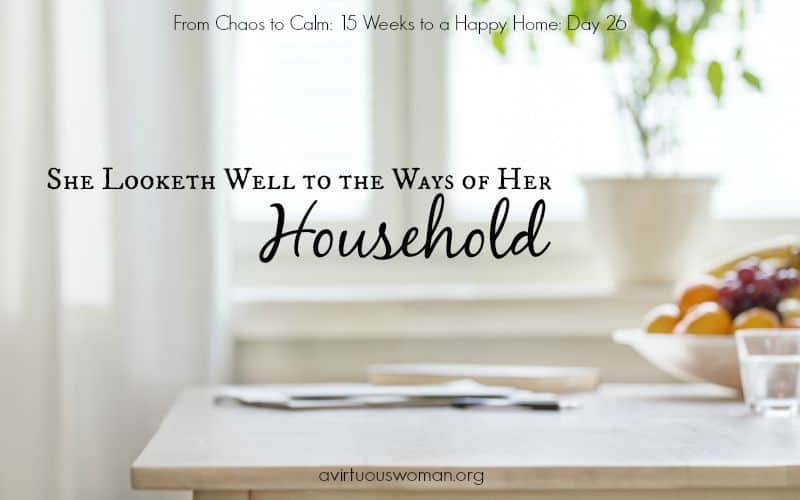 As women, we are called to the ministry of homemaking. God has given us a specific purpose. We may have many purposes and roles in this life: Wife, Mother, Washer Woman, Chef, Nurse, Chauffeur, Teacher, Coach, etc. Our days as wives and mothers are filled with countless activities, social events, and duties. But our first calling is to our homes and our families. Often, housework can become a burden because when we do not work willing with our hands and put off jobs that should be done immediately. If you leave dishes in the sink to wash and put away later, it will take you twice as long than it would have if you had done it as soon as the meal was over. Folding laundry takes only five or six minutes if you do it as soon as the clothes dryer stops. However, if you allow several loads of clean clothes pile up, it can seem to be a daunting task indeed! Cleaning the carpet as stains happen is much easier than waiting until the whole room is dirty. 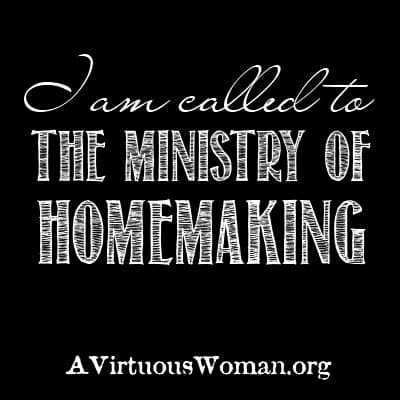 I am called to the ministry of homemaking. Procrastination is a “disease” affecting many a homemaker in this day and age. We need to put off those bad habits and arm ourselves with new ways! We want to look well to the ways of our households. We need to develop our self-discipline if we want to be keepers at home. Being a procrastinator is a form of laziness or a lack of self-discipline. Today, I want you to get a sheet of paper and look around each room of your house and write down those things you are not pleased with. Whether it be, stacks of books, clutter, dingy door jams, or peeling paint – write it down. This will be your “go to” list later in the challenge. In your prayer journal today, I want you to write about your feelings toward your home and housework. Write down what you would like to see happen in this area of your life. Ask God to give you a heart that is willing to work cheerfully. Here’s an image you can use on your own blog or pin to Pinterest or Facebook. Of course, you are welcome to use the image above as well, and I can’t thank you enough for helping spread the word! Praying for comfort and strength for your family. God Bless each one of you. Selina, I appreciate your prayers. Definitely need them! Oh Melissa, I'm keeping you and yours in my prayers. Are the girls okay? Thank you, Leigh. The girls are okay. We knew he was dying, so it wasn't unexpected (not that that makes it better, but...). Robert married my husband's mother about 7 years ago... He was 89 when he died. So sorry for your, loss many prayers for you and your family. I was wondering if when you are able if you could post the pdf for this post. Very appreciated, thank you! Hi Andrea, thank you so much for your prayers. I do appreciate it sooo much! And believe, I need all the prayer I can get! Thank you for letting me know the .pdf was missing I will get that right up! God bless you! I need to have structure in my life, or, guidance if you will. Thank you for The Virtues. Hi Mary, thanks so much for stopping by and visiting with me. I hope you continue to be blessed and that you'll come back soon! Hi! I am just coming across this blog via Pinterest. How can I find this whole series of posts from "the ways of her household" segment? Is there a link somewhere? Thanks!